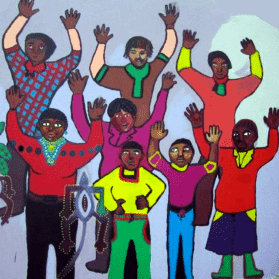 The Siyabanakekela Programme is based on the premise that no healing can take place without caring and that the healing of a society is entirely dependent on the quality of care people of all ages receive in their families and communities. South Africa has an army of community workers, tasked with caring for the sick, the dying, the elderly, and the children. Only very few get proper emotional support within their work place, and with the small stipend they receive they are not able to provide for even the most basic needs in their own families. Even more important, it is a sad fact that many entrusted with the task of caring for the most vulnerable groups in society, have never been cared for themselves and therefore find it very difficult to find within themselves the essential qualities required for meaningful care of others. Strengthening the Wounded Carer has therefore become an essential part of Sophiatown’s work. We engage carers at all levels of organizational hierarchies (from driver to caregiver to director) and challenge them to develop and grow self-awareness and self-care as essential components of their personal and working lives. As carers confront the hurts deep within themselves and are supported through these, they are often empowered to reclaim their agency, re-cover long-buried dreams, and most importantly become emotionally more present to those who have been entrusted to their care, both in their homes and in the work-place. Over the past 10 years we have worked primarily with carers in home-based care organizations, community-based organizations reaching out to vulnerable children, as well as frontline LGBTI activists, and carers in child and youth care centres. Watch this space for Sophiatown’s first major publication: “The Voices of Our Carers”, due to be released early in 2018.